Hot dogs are a summer and barbecue staple. I don’t see them going anywhere anytime soon. But that good old classic hot dog can get a little boring sometimes. So today, I’m sharing an easy recipe to turn those boring dogs into something unexpected and delicious! 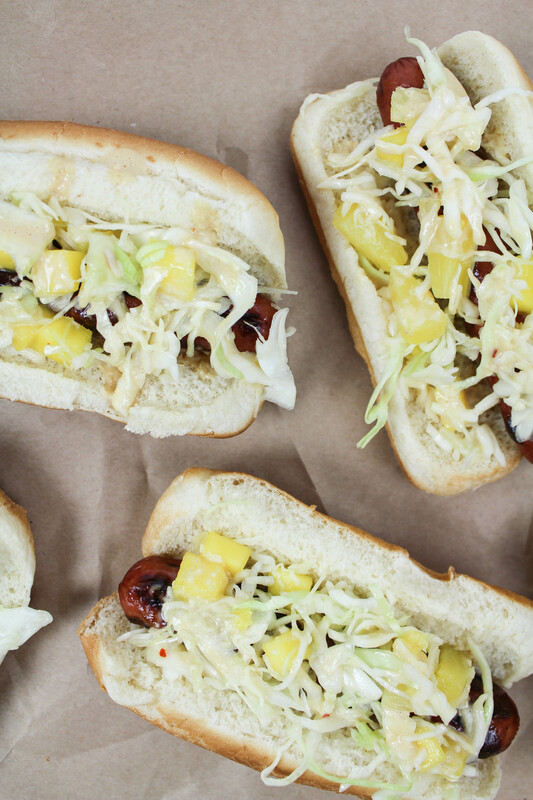 These grilled hawaiian teriyaki hot dogs are really easy to throw together and add a fresh and tropical flavor to the menu! These little babies are perfect to serve up for the 4th of July this year! One of the things that I love about summer cook outs and entertaining is how easy and effortless menu and meal prep is! Everyone is more focused on spending time outside, rather than in the kitchen, but no one wants to sacrifice flavor either! One ingredient that you might not necessarily think of when it comes to hot dogs is teriyaki sauce! I think a lot of people only focus on it for Asian inspired recipes, but it’s actually very versatile and perfect for summer holiday grilling and day-to-day grilling recipes for weeknights. I’m a big fan of Kikkoman® sauces and marinades. I also really love that they have the Less Sodium Soy Sauce and Kikkoman® Less Sodium Teriyaki Marinade & Sauce, which are perfect for those home cooks who are looking to cut down on their sodium levels, without sacrificing flavor. I picked up my bottle of Kikkoman® Teriyaki Marinade & Sauce from Walmart. 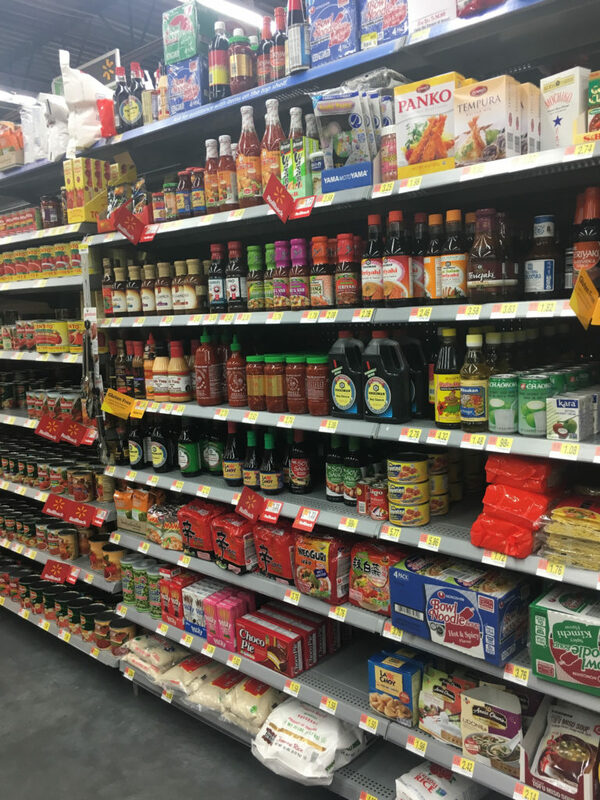 You can find it in the Asian inspired aisle! 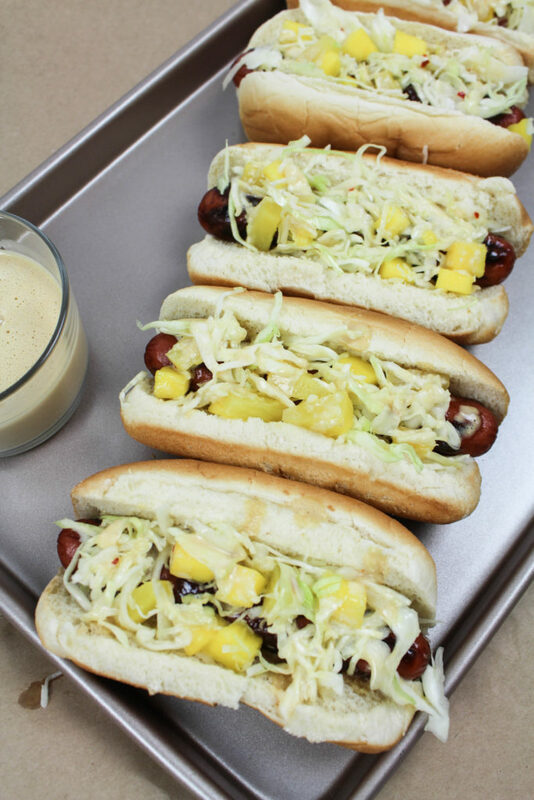 For these grilled hawaiian teriyaki hot dogs, not only are we going to use the teriyaki sauce to marinade our dogs, but we’re also going to make an easy teriyaki mayo to drizzle over the top of those yummy dogs too! 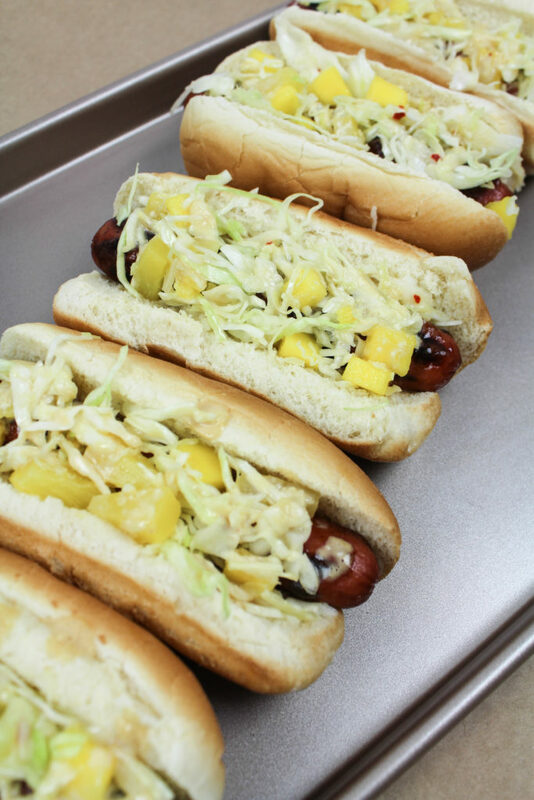 Plus, the fresh and tropical flavors of pineapple and mango come together in a really easy slaw to take these hot dogs to the next level! Ready to grill? Cut a small slit, lengthwise, into the side of each hot dog. (This will help to absorb that yummy teriyaki flavor!) Place your uncooked hot dogs into a shallow dish. Pour the teriyaki marinade over the top of the hot dogs and coat well. Cover and place in the fridge for 30 minutes. While you are waiting for the hot dogs to marinade, prep your tropical slaw. In a medium bowl, combine the coleslaw, pineapple, mango, lime juice, olive oil, green onions, and red pepper flakes. Mix well to evenly coat the coleslaw. Set aside. Next up, create that easy teriyaki mayo to top off your dogs! In a small bowl, combine the mayonnaise, teriyaki sauce, lime juice, and salt. Stir well until completely mixed. Set aside. Prep your outdoor grill and heat to medium-high heat. Grill your hot dogs, turning occasionally, until lightly charred on the outside and heated through the middle. Usually about 5-7 minutes. 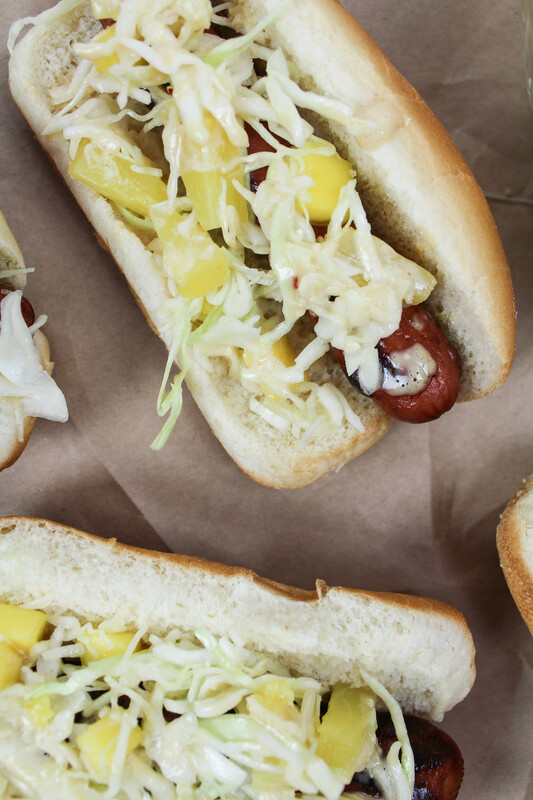 Remove from the heat and start to build those grilled hawaiian teriyaki hot dogs! Place your hot dog on a bun. (If you prefer to have a crispier bun, place them open faced, onto the top of your grill for 1 minute, then remove). 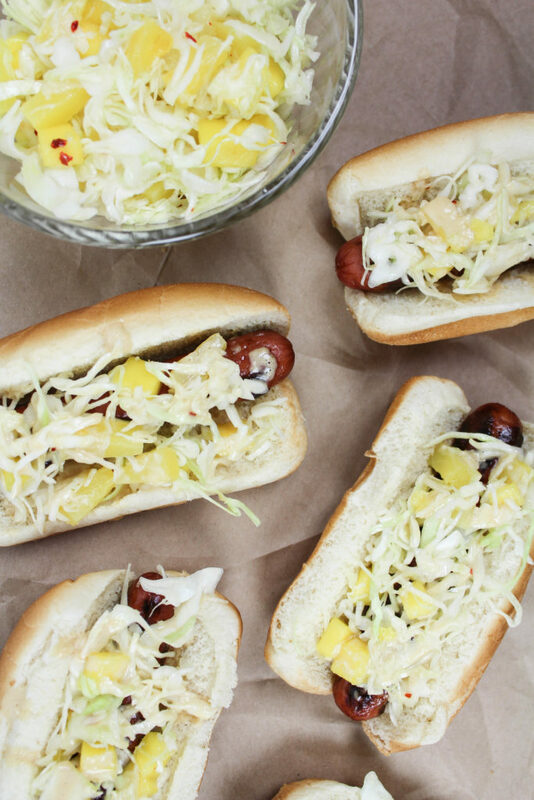 Top the hot dogs with the tropical slaw and then drizzle with the teriyaki mayo. If you’re serving a large crowd, place your toppings on the table and allow each guest to create their own. The toppings are simple but the addition of that Kikkoman® Teriyaki Marinade & Sauce is a major flavor enhancer without any work on your part! These grilled hawaiian teriyaki hot dogs are super easy to make with only a few ingredients, you’ll be the star of the barbecue this 4th of July! Looking for more delicious and easy recipes? Click here for some more summer grilling inspiration! 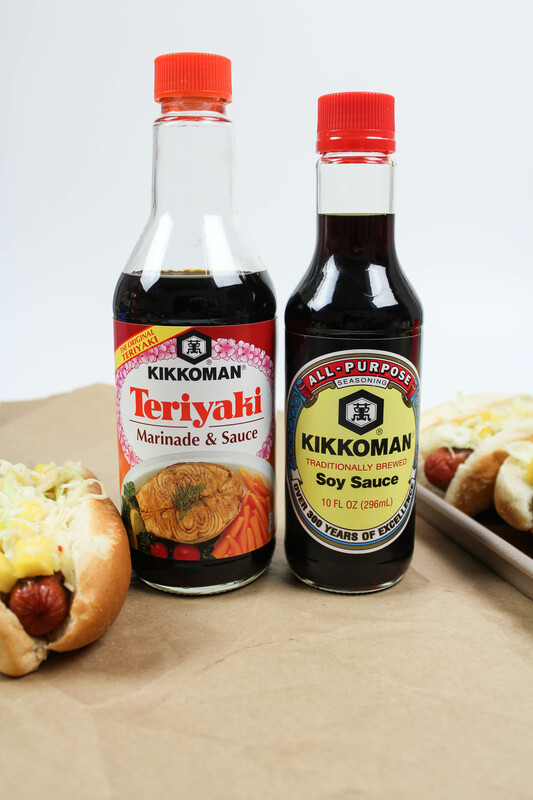 And make sure to check out the Kikkoman® website and grab a coupon for your next bottle here!